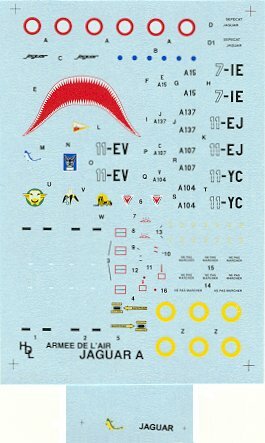 This sheet offers the modeller 4 different decal options for French Air Force. 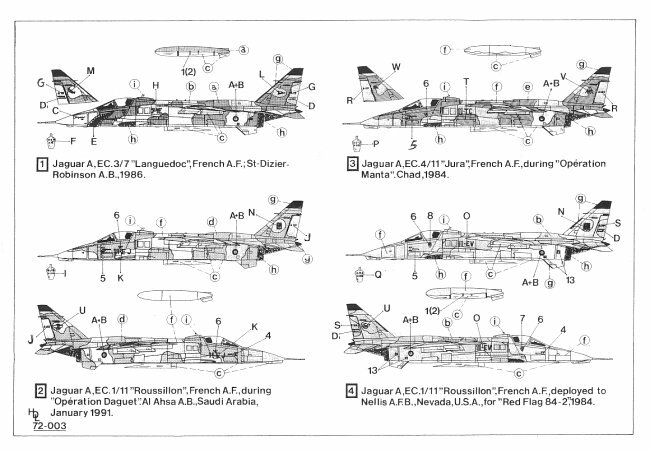 The planes covered on this sheet range from a Jaguar in a French campaign in Chad to red flag deployment in the US in 1984 to Operation Daguet" (Desert Storm) in January 1991. Paint schemes range from grey/green camo to 2 tone sand desert camo. 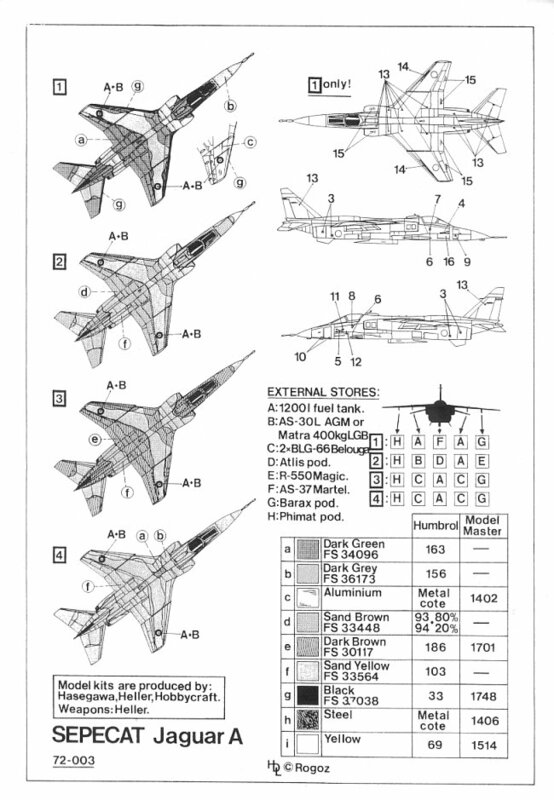 There are enough stencils included to do one of the four Jaguar's featured on this sheet, although with additional stencils all 4 Jaguar's could be made. The first decal option is for a Jaguar A, EC.3/7 "Languedoc" of the French Air Force out of St. Dizier Robinson Airbase in 1986. This particular paint scheme includes a sharks mouth. This jet is Dark Grey (FS 36173) and Dark Green (FS 34096) and what appears to be Aluminium on the underside with some black areas on the vertical stabilizer and wing leading edges. The second decal option is for a Jaguar A, EC.1/11 "Roussillon" of the French Air Force during "Operation Daguet" (Desert Storm) out of Al Ahsa Airbase in Saudi Arabia in January 1991. This jet is Sand Brown (FS 33448) and Sand Yellow (FS 33564) and what appears to be Aluminium on the underside.  The third decal option is for a Jaguar A, EC.4/11 "Jura" of the French Air Force during "Operation Manta" in Chad in 1984. This jet is Dark Brown (FS 30117) and Sand Yellow (FS 33564) and what appears to be Aluminium on the underside with some black areas on the vertical stabilizer and wing leading edges. The fourth decal option is for a Jaguar A, EC.1/11 "Roussillon" of the French Air Force deployed to Nelis A.F.B. Nevada USA for "Red Flag 84-2" in 1984. This jet is Dark Grey (FS 36173) and Sand Yellow (FS 33564) and what appears to be Aluminium on the underside. These decals are clearly printed in register and appear very thin, so they should conform beautifully. The small stencil writing is clear and quite readable on the 1/72 sample I have before me.